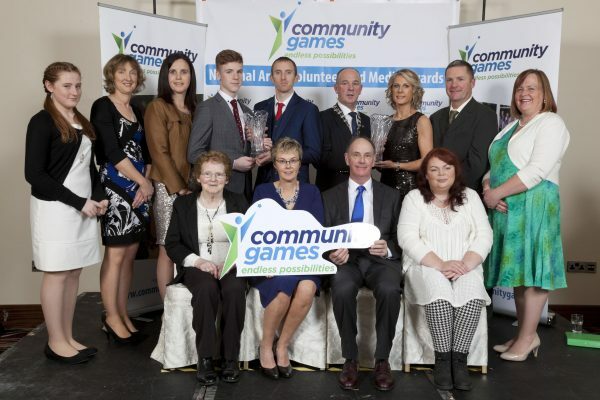 On Saturday 26th November, over 350 Community Games volunteers from all over Ireland attended the National Area, Volunteer and Media Awards in the Salthill Hotel in Galway. MC for the night was Tony O’Donoghue and distinguished guests included former Olympian Olive Loughnane, Minister Sean Canney, Deputy Mayor of Galway Pearce Flannery, County Galway GAA Chairman Noel Treacy, Former DTTAS Secretary Donagh Morgan, Councillor Peter Keane, Philp Gillen of the HSE, Brighid Carson of INM Group and Aidan Doyle of Kia Ireland. The Awards Ceremony is now in its 24th year and is one of Community Games most celebrated and prestigious events with over 100 prizes being awarded on the night. Adult and Youth Volunteers are the cornerstone on which Community Games is built and these Awards reflect the tremendous work being carried out at grassroots level across all four Provinces. Media winners were nominated and judged in a variety of categories such as best ‘Social Media’, ‘Best Regional Newspaper’, ‘Best Area PRO’ and the Irish Independent sponsored ‘Best Published Article and Best Published Picture’. The marketing of Community Games at regional level is as important as the marketing at National level and something we encourage among all of our volunteers. The night was particularly special for Jimmy O’Regan in Limerick who won a brand new Kia cee’d GT Line sponsored by the Official Car Partner Kia Ireland. The raffle was held ahead of the Golden Jubilee with tickets being sold Nationwide from last August. Each Area that sold tickets retained 70% of the proceeds to assist in their drive to raise development funds for their own areas. Runner up prizes for The Golden Jubilee Raffle were Hotel Vouchers from 12 Irish Hotels. The Golden Jubilee raffle proved to be so successful that a separate draw was held for the many areas who sold over 4 books of tickets with Steelstown in Derry winning €500. There was much cheering as Ballymahon Forgney were crowned overall Area Winners on the night for the second year running! Ballymahon Forgney were also awarded the Steps to Health 2016 Gold quality standard – one of only three areas across the country to be honoured in this way. As Community Games gears up for its 2017 Jubilee celebrations one thing is for sure – the possibilities are endless. Here is the full list of winners on the night. KIA Cee’d GT Line Car: Jimmy O Regan. Co. Limerick.